Last week saw the Chamber’s AGM – Another Great Margarita – being held at Hemingways. 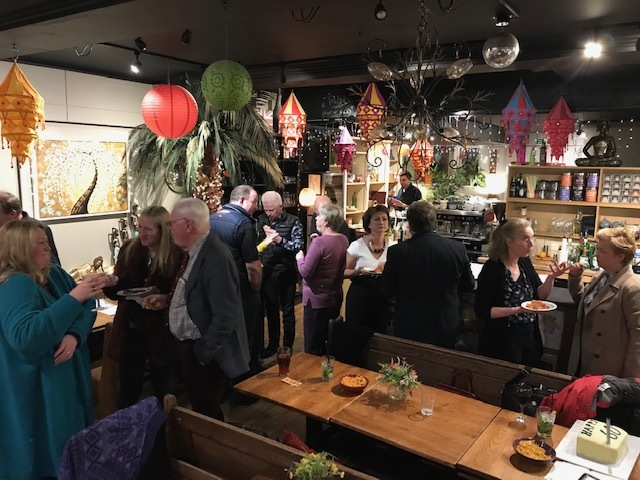 It was an opportunity for members to get together and celebrate what had been achieved in the last year and looking forward to the year ahead. Those who attended were treated to a free cocktail or drink of their choice, whether that was a mojito, martini or margarita (or even mint tea!) as well as pizza. 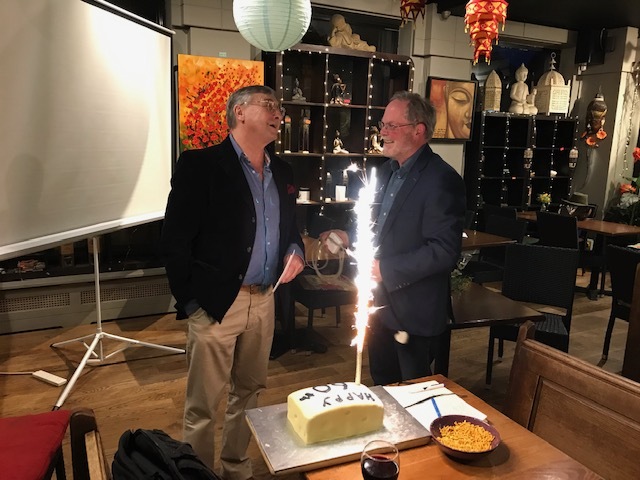 The party atmosphere really got people talking and was made all the more authentic when a huge cake shaped like a cheese with what can only be described as a firework sticking out the top was presented to Chamber President Craig, who had celebrated a BIG birthday the day before. AGM of course also stands for Annual General Meeting. So in amongst all the merry making, those gathered were told about what the Chamber has been doing for the last year and what it intends to to for this one. In his address to the AGM, Chamber President Craig McGowan told those gathered that the past year had been good for the organisation. Membership has grown by more than a third this year from 80 members to 110, making the Chamber the most successful in the Borough both in terms of members and income. The BIG Awards attracted several 100s of businesses from across Waverley. The Chamber has been working hard at the BID involvement. It has also changed Haslemere Town Council’s approach to car parking (to provide more lower cost parking in Tanners Lane), and the Chamber is now in negotiations with the Co-op to improve the car park behind Collingwood Batchellor and make it available and affordable to town workers. The Business Centre goes from strength to strength, having paid for the Chamber’s contribution to the town Christmas lights and looking to put more funds to work for local businesses. The Chamber’s Acting Treasurer, Caroline Warrington, told the AGM that while the membership had dropped over the last couple of years, meaning that the Chamber was bringing in less money, spending had not, and the budget is now much tighter. Increased new membership and renewals this year means the Chamber now has surplus within the budget. Eddie Paterson stepped down as Chamber Vice President at the AGM to replace Tom Pearse who has stepped down as Membership Manager. Craig thanked Eddie for all his hard work, particularly with the BIG Awards and the BID process among other tasks. He also thanked Tom for his service as Membership Manager. BID review – in it to win it? The AGM had an update on the BID process and the feasibility report. The scheme could see the town add a small proportion to business rates with the money raised being spent solely on initiatives designed to make Haslemere and Wey Hill more attractive to visitors. The feasibility report by specialist consultancy Mosaic, featured a SWOT (Strengths, Weaknesses, Opportunities and Threats) analysis of the town along with survey results of what business think BID should do. Details can be found on the Chamber website https://haslemerechamber.co.uk/business-improvement-district/. 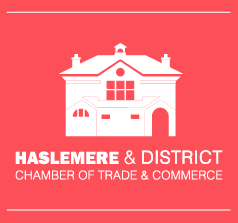 The next phase involves creating a business plan and consultation with all businesses in Haslemere and Wey Hill on what the additional rate should be and where these funds should be invested along with a vote on whether or not to proceed. There are currently 283 businesses in the town and for BID to be approved 51 percent of these need to agree. As this phase needs to be run by an external company and the vote run by an independent organisation, such as the Electoral Commission, to ensure impartiality, a Government loan of up to £50,000 is available to cover these costs. In the event that the BID process does not get approval, the loan does not have to be repaid. There was a general feeling at the meeting that while it would take a lot of work the benefits to the town could be great and that “You have to be in it to win it”. Networking opportunities, communication and lack of numbers attending Chamber events were highlighted as key issues by those members responding to the “What do you want from your chamber” survey. The committee will meet to discuss how we can improve these for members. The survey results, compiled by Michelle Carrington and Theo Sahlsberg, also found that members who had been with the Chamber the longest were most satisfied with how it was performing. A full rundown of the survey results will be on the Chamber website soon. The 50:50 Club is looking for more members to become active again with John Lloyd of Blue Dot Display agreeing to take the helm. The basic premise of 50:50 is that members choose a number and pay £5 a month to enter a draw. Half the total pot goes to charitable causes, the other half to the winning member. If you would like to sign up contact john@bluedotdisplay.com.